Kugutsu: That’s the way to do it! 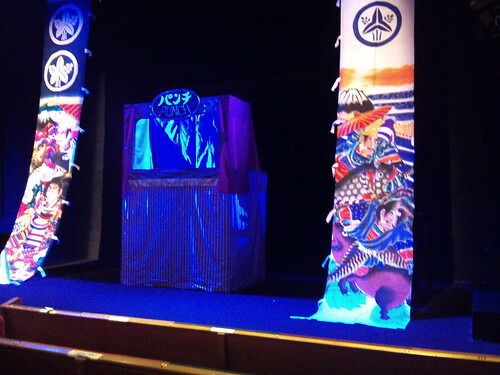 Out of curiosity I went along to the Little Angel Theatre in Islington tonight to see a Japanese puppet show… and it was the best night out I’ve had in a long time! 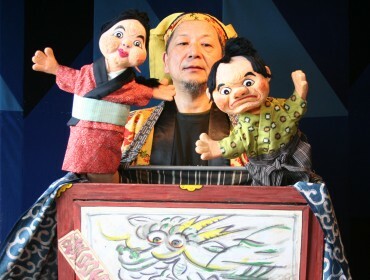 Kugutsu – An Evening of Japanese Puppetry featured two masters of kugutsu (Japanese puppetry): Shiro Ito and Eimei Katami, who had come to England to perform as part of the The Big Grin Festival, which celebrates Punch and Judy‘s Mr Punch’s 350th birthday. The performance was introduced and directed by Professor Yoriko Iwata of Chukyo University in Nagoya. 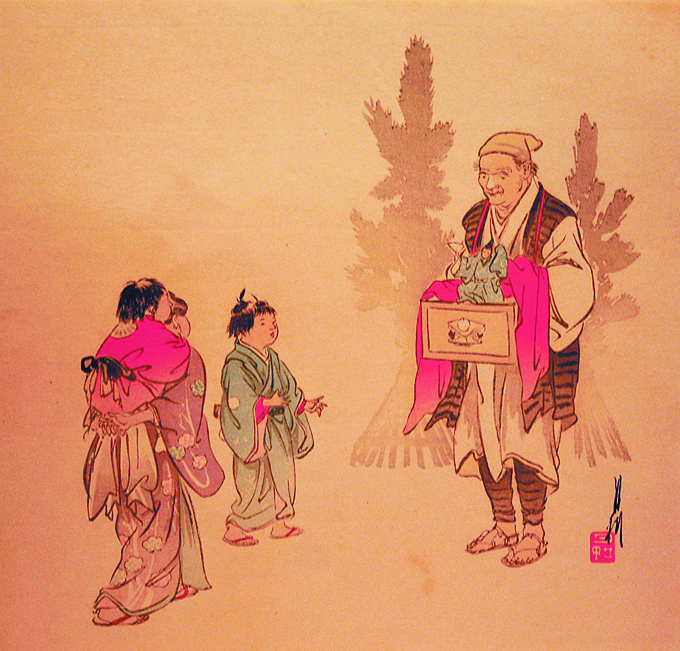 One of the earliest forms of hand puppetry, kugutsu, was first seen on the street corners of Kyoto in the 7th century. The puppeteers – or kugutsu-shi – performed from a waist-high box suspended from their necks by a cord. It was in 1988 when Percy Press II (Percy Press Snr. is considered the ‘king of Punch and Judy men’) came to Japan that Uncle Shiro (Shiro Ito) started his Punch show in and around Tokyo. 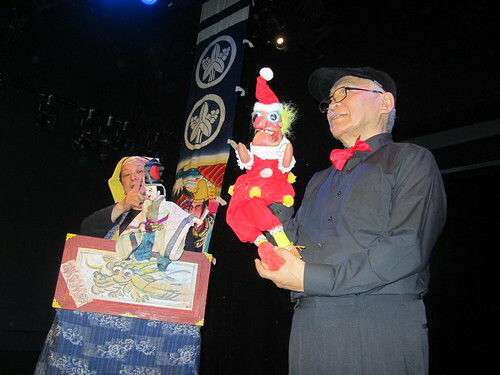 It was intended that before Percy’s performance, Uncle Shiro would introduce what Mr Punch is like to the Japanese audience who knew nothing of it. Ito did it so well that Percy accepted him as a Punchman. 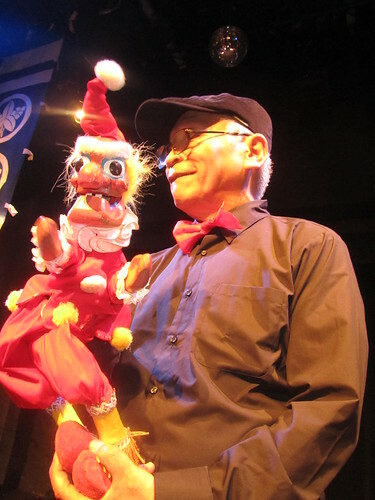 In addition to his career as a dexterous puppeteer for more than a quarter of a century, he has played Punch for another quarter of a century. The first printed script of Punch and Judy (1828) was based on a show by traveling performer Giovanni Piccini, illustrated by George Cruikshank and written by John Payne Collier. In 1972 this text was translated into Japanese by Jiro Nan-e. Ito adopted and changed it to some extent, so that it would be loved by Japanese children and their parents. He uses Punch, Judy, Toby the dog, the Policeman, the Devil (who is green! ), Mary (instead of Pretty Polly), and Daddy of Mary (Doctor Figure). No Joey the Clown, Beadle or Crocodile appear in his show. A key feature in Ito’s Punch and Judy is that no one ever dies. In Ito’s shows, Punch and Judy are not man and wife; Judy is Punch’s next-door neighbour. Ito believes that, because this entertainment is aimed at children, it should be clean, educational and moralistic. Hmm… makes you think about the original British version, doesn’t it? Ito’s Punch and Judy ‘hut’ is shorter than a British one, and he kneels down during his performance. 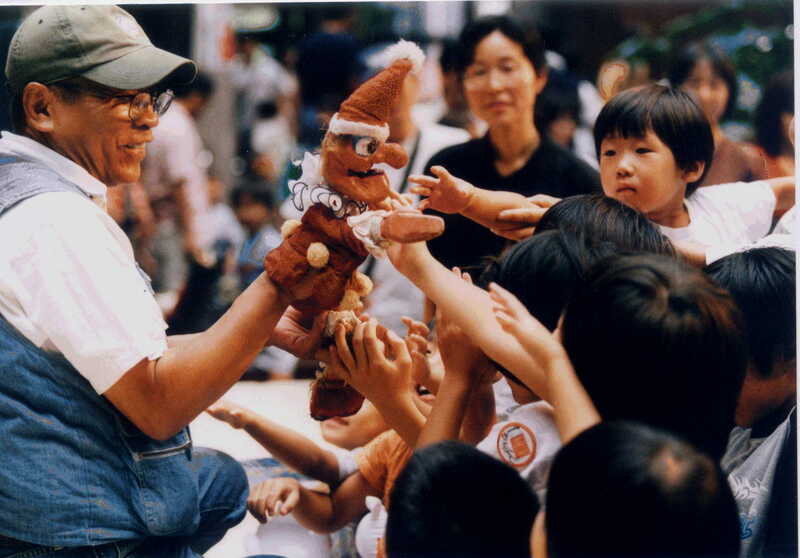 His puppets are made by Toru Saito, a leading puppet maker in Japan, and are quite small so that they fit his hands. He also plays the harmonica while performing. I found joy in many things tonight: the hilarious stories told in a mixture of English and Japanese, the fact that I understood a good 80% of the Japanese used, the incredible craftmanship of the puppets, the dog, and the mirror. There were three stories. The first was Shiro Ito’s Punch and Judy. The star of the show for me was Toby the dog, who was so funny, and so cute. Punch himself was hilarious too, and was full of all the usual gags which seemed to translate so easily. The story was told in exactly the kind of mixture of English and Japanese which I usually have in my head, so I was delighted to find that I understood everything! The second story, told by Eimei Katami, was done in a traditional kugutsu style, beginning with Katami entering from the back of the tiny theatre and walking up the aisle as if he were in the streets, calling for people to watch his show. The characters in Katami’s story were O-Hana-chan and Man (he has no name). Man looks like a worn-out samurai, and O-Hana-chan describes herself as an eighteen-year-old, shy maiden. However, O-Hana-chan is quite aggressive and very strong, demanding that Man plays sumo wrestling with her. If I understood it correctly, there was also a joke about what kind of “playing” they could do, as it was an evening show for adults, and I think Man got a thump for that! The puppets were gorgeous, and I somehow understood the vast majority of what was said. As my Japanese hasn’t improved that much, I can only assume that the Japanese used was simple and aimed at a younger audience. I’ve never been able to enjoy comedy in Japanese much before, but this was laugh-out-loud funny. I think the funniest part was when O-Hana-chan demanded that they play rock, paper, scissors (“janken”). Having puppet hands, they naturally couldn’t make the shapes required, so there couldn’t be a winner. O-Hana-chan sighed in frustration and told Man to use his imagination, and then declared she was the winner after the next round. The third story, told by ShiroIto, was Snow White told in kugutsu style. All of the puppets were brilliantly designed – especially the queen who literally flipped over to become a witch in one fell swoop. But the star of this last story was the mirror. The queen, looking at the mirror, demands that it tell her who the fairest one of all is (“oshiete kure!”). The mirror flips open its comical eyes, and drops a miserable looking mouth open when to respond, “anata” (you), seeming thoroughly bored. It was brilliantly simple, yet hilarious stuff. Amazingly, Ito managed to operate all of the characters (including the Seven Dwarves) all by himself! I admit that I had never heard of kugutsu before I saw this show advertised, and thought Punch and Judy was silly seaside entertainment just for kids. It’s been a long time since I’ve seen British Punch and Judy, but I think it’s safe to say that tonight’s show was better than anything I’ve ever seen before. The Punch and Judy style show worked really well, but having the chance to see traditional Japanese puppetry was wonderful. I just can’t get over how much I laughed and enjoyed myself! As Mr Punch would say, “That’s the way to do it!”. It’s a shame tonight’s show was a one-off, as I would love to encourage you all to go and see kugutsu for yourselves. 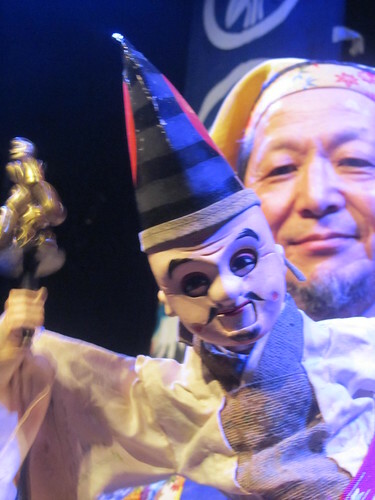 However, if you’re in London this weekend there is a chance to see Shiro Ito and Eimei Katami in Covent Garden as part of the Big Grin Festival celebrating Mr Punch’s 350th birthday. If you’re in Japan, maybe you can find a local kugutsu performance (although I’m not sure how popular it is these days). The Foundation Modern Puppet Center in Kawasaki is probably the best place to start if you really want to see a puppet show in Japan, and Puppet Theatre Puk in Tokyo is probably another good place to check out. When I talked about this kugutsu performance with Japanese friends, I was surprised to find out that some didn’t even know the word.So, I’d be curious to know, have you ever seen kugutsu? With special thanks to the Little Angel Theatre for some of the pictures above and parts of the informative text. this sounds so fun! it’s cool to see how ideas like that exist translated and re-translated between cultural histories. Thank you for your quickest response. It is our greatest pleasure to read your article. See you at Covent Garden 12th and 13th!